In this post ,I have given a simple example on how to use JPA in Spring Framework. You can find the source code of the below example in my Github link here. I have considered a MusicStore example, where i just get the list of Songs from the database. While I was working on integrating JPA into Spring , I felt that, the most important part to concentrate on , is the CONFIGURATION area. <context:component-scan base-package=”…..”> – This component-scan tag also enables the usage of JPA annotations. (i) annotation-config —> enables the usage of JPA annotations , only in the beans specified in the context.xml whereas (ii) component-scan —> scans through all the packages specified, records all the project beans having JPA annotations, into this context.xml. Therefore it enables JPA annotaion usage in (beans specified in context.xml)+(Project Beans). When we use <component-scan> in the app-context.xml, it’s not necessary to use <annotation-config> again. Even if both the tags are specified, it’s not a problem because, the spring container would take care of running the process only once. 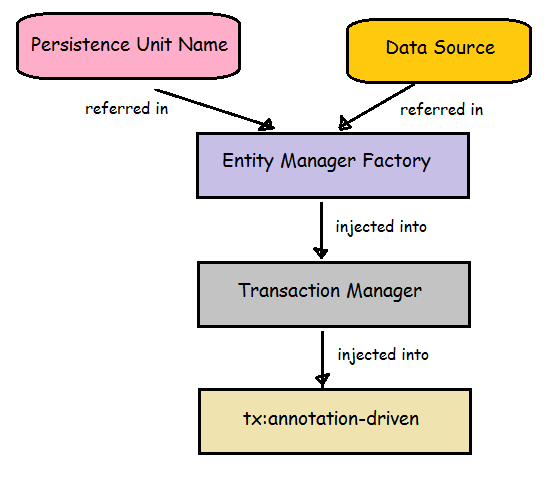 <tx:annotation-driven transaction-manager=”transactionManger”/> – It checks for @Transactional annotation in any of the classes. This tag is like a Transactional Switch that turns on the transactional behaviour.Here Transaction Manager is being injected . <bean id=”transactionManager”>– Here Transaction Manager is setup. Here EntityManagerFactory is being injected. <bean id=”entityManagerFactory”>– Here EntityManagerFactory is setup .Data Source reference and Persistence UnitName Reference is specified. <bean id=”dataSource”> – DB connection details are specified. provider – In this example, I have used Hibernate provider. properties- Few settings(like showSQL=true) required are specified. Configuration part is over. Now that, it’s time to use the annotations in our Dao class to make the Spring – JPA work. Now , when you run this main class, for sure , you would only get Errors and Exceptions :-P.
Because, we have not yet added the DEPENDENCY JARS. Below , I have given a note on the Errors and Exceptions that would arise and the corresponding jars to be added to clear that particular problem. ERROR: Exception in thread “main” java.lang.ClassFormatError: Absent Code attribute in method that is not native or abstract in class file javax/transaction/SystemException. JAR: javaee5-api.jar . Do not forget to specify the scope as “provided”, otherwise the error will still persist. ERROR: Exception in thread “main” java.lang.ClassFormatError: Absent Code attribute in method that is not native or abstract in class file javax/persistence/EntityManager. Do not forget to add the respective JDBC jar. Now the program can be executed.